Are Loose Teeth A Sign Of A Gum Disease? No one really thinks about their teeth until they have a problem. One of the common problems that people face is having loose teeth. What causes the teeth to become loose? How can it be prevented or treated? Read on to find out. Gum disease is also called as Periodontal disease and is extremely widespread around the world . In its most common form, the spread and progression of gum disease is quite slow and is not associated with pain. If patients miss or ignore the early signs of gum disease, then it can result in widespread destruction of the dentition resulting in tooth loss. The symptoms of gum disease include bleeding gums, loose teeth, widening of spaces in between the teeth, bad breath, and tooth loss . Patients often find out about the presence of gum disease when they seek bleeding gums treatment from their dentist. Are loose teeth a sign of gum disease? 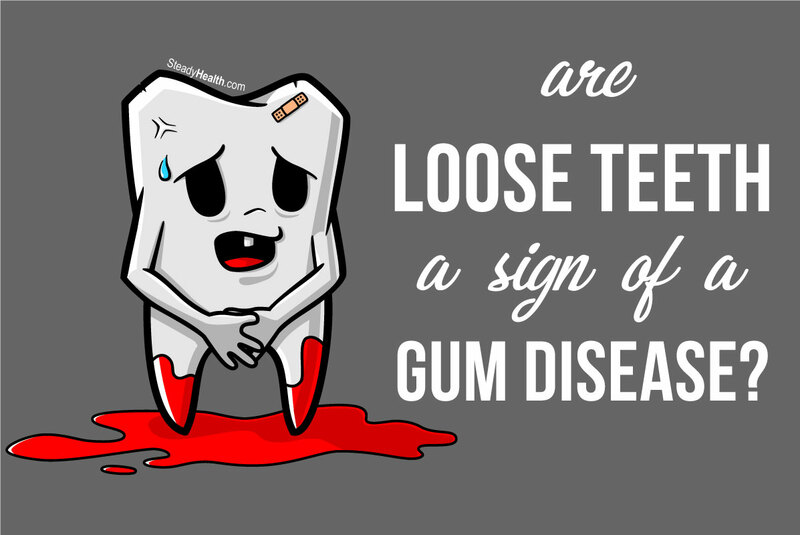 Yes, loose teeth are a sign of gum disease . In fact, loose teeth are a sign of advanced gum disease that has started to destroy the supporting bone around the teeth. In normal circumstances, the teeth in our mouth remain firm because they are embedded in the jaw bone . Gum disease, however, starts to destroy this bone and over the period of years causes the teeth to become loose. Since this process is quite slow and the teeth do not become loose until well over 60% of the surrounding bone has been lost, a loose tooth indicates the presence of advanced gum disease . The first step in the treatment of loose teeth is to assess the damage that has been done so that the correct plan can be formulated. The dentist will take a few x-rays of all the teeth that have become loose to assess the amount of remaining bone. A clinical examination of the grade of mobility will also be done . Teeth that have very little bone remaining or are extremely loose will have to be extracted. For teeth that are only slightly mobile efforts can be made to improve their situation. A thorough scaling of all the teeth will be performed to remove any plaque and tartar that may have accumulated. This is the same kind of cleaning that is done during bleeding gums treatment. The immediate result of scaling is a reduction in the inflammation around the gums. The removal of tartar from around the loose teeth can actually make the tooth more mobile for a few days, something which can be disconcerting to the patient . Flap surgery followed by the placement of bone graft may be considered in an effort to increase the bone support of the loose teeth. The amount of bone that can be augmented is limited as are the situations where this kind of treatment can be carried out . Bone loss after a certain point of time is irreversible and even though progress is being made in the field of tissue regeneration, plenty of time still remains before we can just grow backbone around the teeth. In some cases, the cause of bone loss may be a traumatic occlusion. The manner in which the teeth meet each other could be putting an increased amount of force on to one or more teeth . This situation can be rectified by correcting the occlusion and ensuring that the forces being transferred to the teeth are within physiologic limits. A blow to the teeth like during an accident or a fight can also damage a tooth and cause it to become loose for some time. The dentist may choose to splint the teeth together and or just let the normal process of healing take place. In most cases, the loose teeth become firm and function as normal teeth thereafter . Can you prevent loose teeth from occurring? One of the biggest misconceptions that are prevalent among people is that teeth come with an expiry date or that teeth becoming loose and falling out is a normal part of old age. There is enough evidence to suggest that this is absolutely not the case. Teeth will remain healthy for the duration of the lifespan of the individual if they are taken care of. Good oral hygiene, avoiding poor eating habits, and getting a regular checkup done at the dentist is all that needs to be done to avoid loose teeth . For people that have already developed loose teeth, getting the proper treatment done to return to the baseline of no active infection is the first priority. The teeth mobile or the ones remaining after extractions have been done can be maintained through the steps mentioned above. For people that have healthy teeth, a scaling done even once a year can be sufficient for them to maintain good oral health. For people whose teeth are not in the best condition and have just received treatment for loose teeth, getting a scaling done every six months or even every three months is the only way to prevent the return of gum disease. Don’t wait till your teeth start to become loose, taking proactive steps is simpler, requires less time, and is much less expensive. What is causing receding gums and what can you do about it?